The new, and yet to be named, Goodyear blimp secured to its mobile mooring mast. 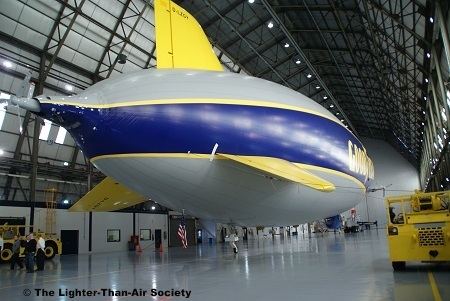 Front view of the airship inside Goodyear’s Wingfoot Lake hangar. 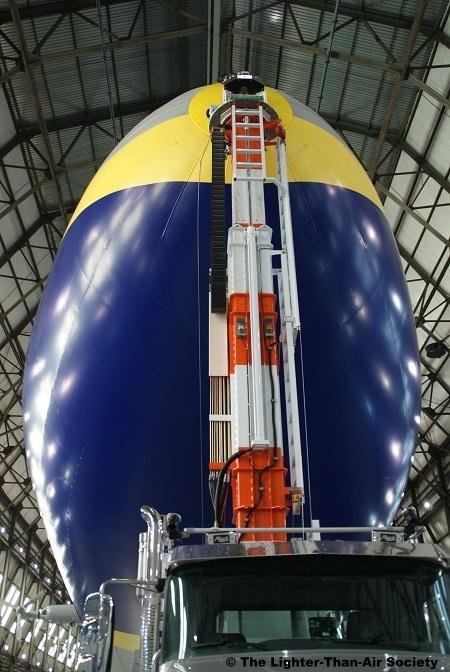 The airship’s nose cone is securely attached to the mast. 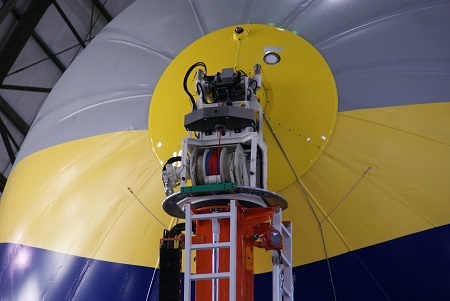 Stern of the blimp. Note the three-fin design. Port propeller. 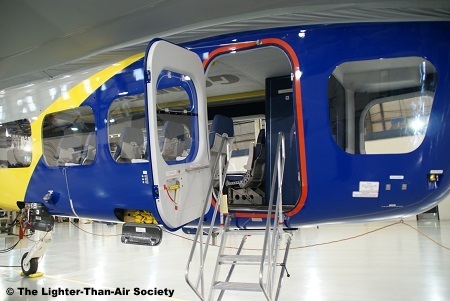 The large housing attached to the frame inside the hull contains the motor. 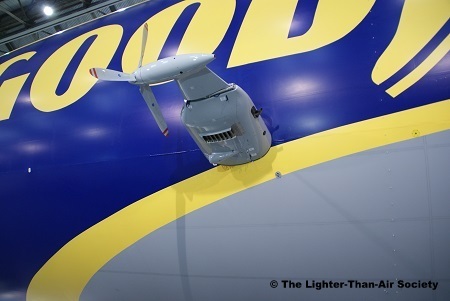 The propeller can be swiveled up 120°. 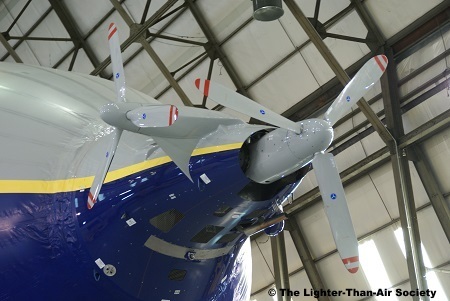 The two stern propellers are driven off one engine. One helps impel the blimp, the other one assists in steering it. Access door to the gondola or passenger car. 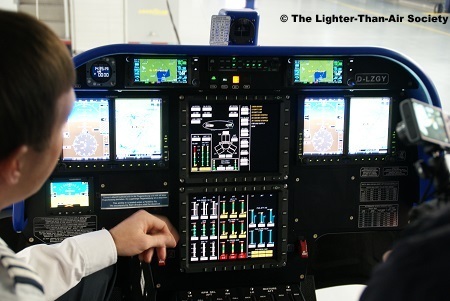 The cockpit displays are all digital. They have redundant systems and as an emergency back up, there is a battery operated unit that also displays the data. Detail of the port elevator. 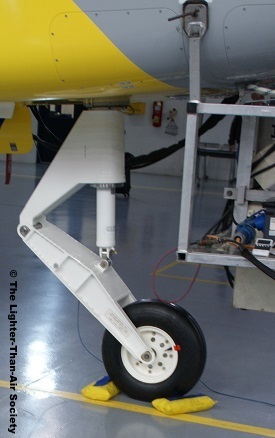 Front landing gear attached to the gondola. The rear wheel is attached to the keel of the ship. In the background one of the handling mules. 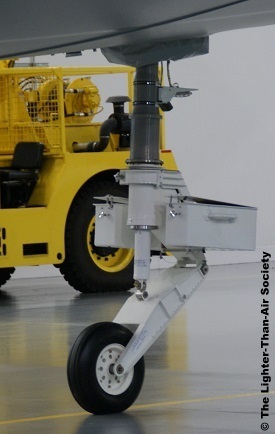 One of two mules used primarily to assist in moving the blimp in and out of the hangar. 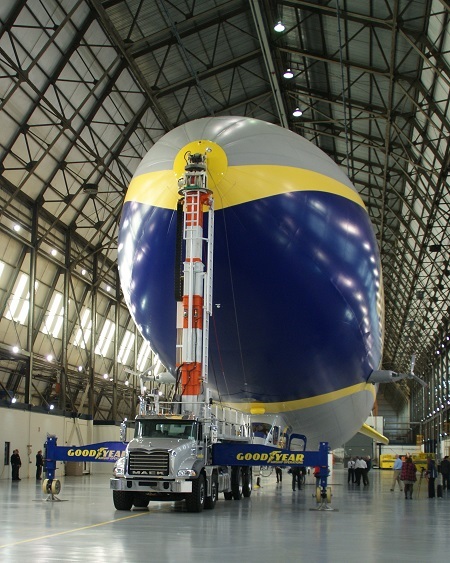 The mobile mast truck is used to secure the blimp when it is on the ground. 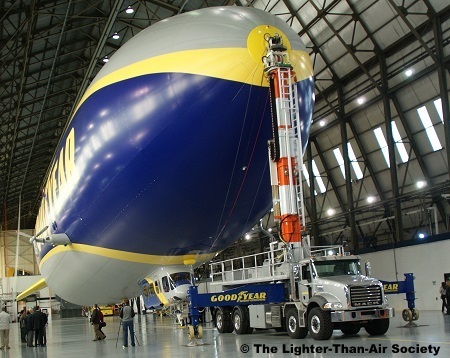 It travels with the blimp to all destinations where the blimp will land. 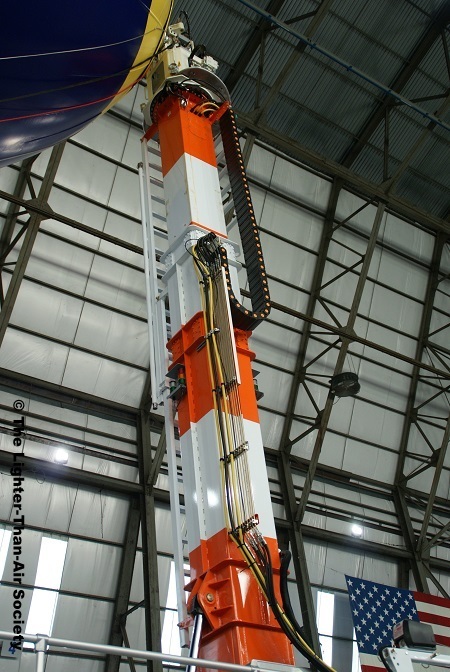 The mast is hydraulically controlled. 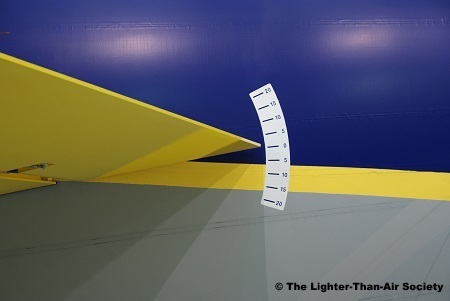 It is used to secure the blimp safely while it is on the ground. 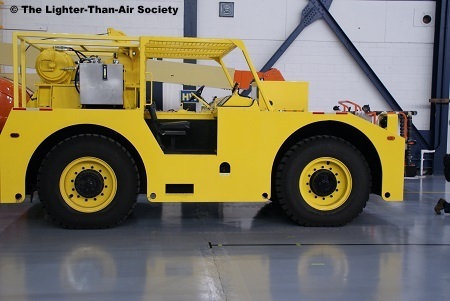 The top of the mast is equipped with a winch that pulls the blimp to the mast and securely couples it in place. 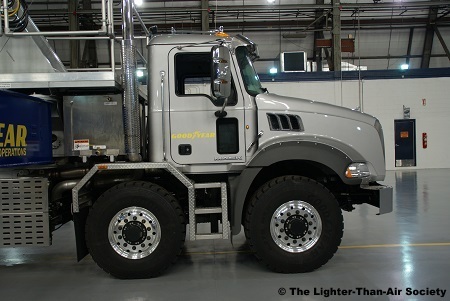 The truck has dual steering front axles. They also provide traction while the truck is in first gear. 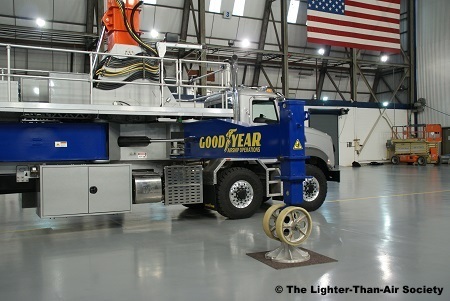 The mast truck is equipped with two outriggers on each side to stabilize it. When deployed in an X formation, the truck and blimp can withstand winds of up to 90 mph. 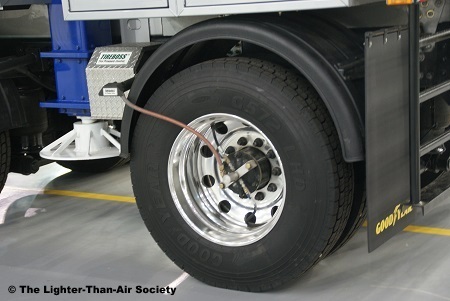 The mast truck is equipped wit a tire pressure control system that allows it to reduce tire pressure when the truck is on soft ground. 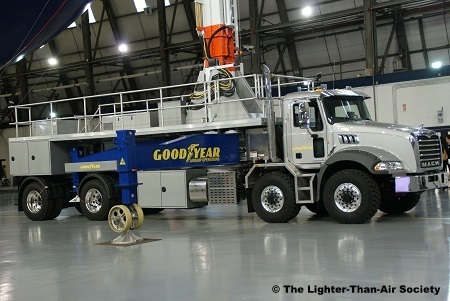 It can increase pressure again when the truck returns to firm ground.